Have you ever felt like you are not moving things forward in your business? If you have then it is probably because you aren’t measuring yourself against your business goals. Don’t be another small business owner who doesn’t set goals because “you’ll never end up achieving them” or just backing out on your goals altogether. If this sounds like you then you need to shift your entire way of thinking when it comes to setting goals. Taking the time to set goals and following through on them is an investment that pays off immensely in the long run. If you are wondering what it is that you can do to realistically look at your business and create goals then follow these tips. Focusing on long-term goals in a certain time-frame is crucial. 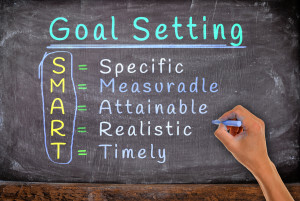 These goals have a place in your overall goal setting though you really need to focus on setting clear, attainable goals in the short-term as well. Take college, for example. When you start off as an undergrad, you set the goal of attaining your bachelor’s degree before going on to pursue a master’s. Your goal roadmap should have goals that can be achieved sooner rather than later, which will help you achieve your long-term goals. Creating these goals could also assist you in realizing your vision even better. Setting goals is great and all, but you also need to make serious efforts to attain those goals. If you’re going to be developing something like content, then you should put aside one day a week to do specifically that. Be productive. Set deadlines. It is so easy to get distracted or discouraged so it is imperative that you stay focused as much as possible. One of the best ways to keep on track is to eliminate or avoid distractions whenever and wherever possible. Take a good, long look at where you are currently and ask yourself this: “Is this where I want to be?” Is is crucial that you are 100% clear with yourself about your current situation, especially when it comes to thinks like money, accounts payable, sales pipelines, and processes. As soon as you have established what your current situation is like, you can then look forward to the future and the goals you have set for it. You need to make some short-term tasks that you want to achieve for the next year. Monthly and weekly sales goals can help you move closer to your revenue goals. Set a goal for increasing things like cold calls, posts on social media, and direct outreach if you are looking to increase sales. Trying to generate more traffic to your website? Create a content development system and start an editorial calendar. Trying to get more subscribers? Develop a new, free download for your website. It will be impossible for you to achieve your goals if you don’t take any steps towards doing so. There’s nothing quite like some good old-fashioned hard work. And it is this hard work that really determines your outcome. A lot of small business owners spend a lot of time working on their day-to-day activities, refusing to put enough time and resources towards achieving their professional goals. These people are the same ones surprised that their business has failed or their goals have been left behind yet again. The amount of energy you put towards a goal and the likelihood of you accomplishing that goal go hand-in-hand. 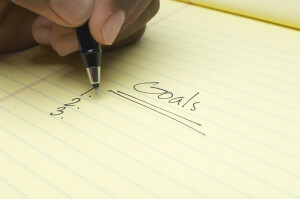 Set your annual goals first, then your monthly goals, and then your weekly or daily goals. Once everything is organized you will start to see a difference in your business. If you’re having a hard time setting goals, or an even harder time sticking to those goals and accomplishing them, you’re not alone. But just because this is an issue with other small business owners doesn’t mean it has to be an issue with you. Look over these tips, understand them, and then put them into practice with your own small business. I promise, if you really put an effort into your goals, you will find them accomplished more often than not.